Perhaps the best way to introduce the book is to include excerpts from the preface (below). If some of the questions it raises pique your interest (and they should), then you might well enjoy this fascinating study. 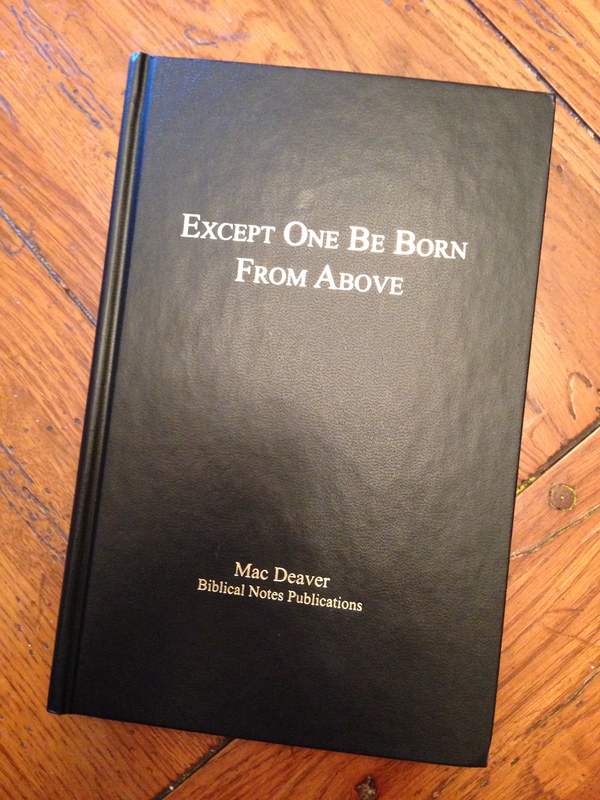 Having read several times through the manuscript prior to publication, I’ve found it simultaneously simple, challenging, faith-building, and significantly helpful in understanding and appreciating the crucial concept of “new birth” as taught by Jesus. In point of fact, the word “groundbreaking” comes to mind — not in the sense of its being new, but, rather, by way of its clearing aside a few baseless assumptions, making it possible to see better what the New Testament has been saying all along. Have you ever wondered why it is that some of us have claimed for years that there are certain “measures” of the Holy Spirit when, in fact, the Bible says that there are none? Have you ever heard anyone ever really conclusively prove that Holy Spirit baptism was an exclusively first century phenomenon? Why is it that the cases of kingdom entry in the book of Acts are usually all called cases of conversion, when in some of the cases, conversion does not take place on the same day that kingdom entry does? Why wasn’t Cornelius told to repent of his sins? How is it that he could be baptized in the Holy Spirit before he was baptized in water? And if his baptism in Spirit was to prove that it was time for the Gentiles to enter the kingdom, then why didn’t we conclude that when it was time for the Samaritans to enter the kingdom that their reception of the Holy Spirit was a baptism in the Spirit as well? And what do human hands have to do, if anything, with the reception of the Holy Spirit? When did the apostles actually enter the kingdom? And when did they repent of their sins? Did they repent of their sins on the same day that they entered the kingdom? Why was Jesus baptized in water? …And why is it that most members of the church have assumed that in Matthew 28:18-20 (when Jesus was giving what we call the “great commission”) even though he was speaking to the apostles only, we somehow reached the conclusion that we are included, but in Acts 1:5 (in the same context) when he was promising Holy Spirit baptism as he was speaking to the apostles only, that we are somehow excluded? What is wrong with such analysis? And just what was lacking anyway to prevent the kingdom from being established prior to Pentecost of Acts 2? How could Apollos be a member of the church and yet not know that the Holy Spirit had come? When did the apostle Paul receive Holy Spirit baptism? And why is it that for years and years many of us have simply assumed that Holy Spirit baptism is miraculous in its nature without ever seeing any conclusive proof (logical argument) that such is so? How is it that members of the churches of Christ, generally speaking, reached the conclusion that Holy Spirit baptism is not applicable today? …Is it possible that we have failed to recognize a key distinction between baptism in Spirit and power from Spirit while at the same time we elevated the use of apostolic “hands” in Scripture to a position or status that they never had? And how does every case of kingdom entry in the book of Acts “square” with the words of Jesus in John 3:5? Have you carefully considered the historical transition that was taking place in the book of Acts which transition lasted for about thirty years and which was an exclusively first century phenomenon? And have you ever thought about the precision of the words of Jesus to Nicodemus and what he left out that we, on occasion, have assumed that he meant? Is there any justification in the same context for taking water to mean real water, and flesh to mean real flesh only to conclude that Spirit in the very same passage has to be something other than Spirit and cannot possibly be the Holy Spirit himself? If you have ever been puzzled by some of the questions here posed, you may want to explore the contents of this book. In this volume, Except One Be Born From Above, such questions will be answered and greater clarity thrown on the book of Acts because of the angle from which it is and should be viewed. It is amazing how many passages we in the past have unintentionally distorted in order to make them harmonize with our incorrect view on Holy Spirit baptism. But once the correction is made, it is absolutely astonishing as to how many more passages can be left alone to simply convey the meaning originally intended. This is not a book that calls in question the absolute necessity of water baptism, for water baptism has actually been conclusively proven by sound argument in public discussion to be essential to the forgiveness of a sinner’s past sins. I have debated this issue myself, and I am thoroughly convinced of the essentiality of water baptism in order for a sinner to become a saint. The revisiting of the water baptism topic can only reconfirm the truth that we have for years rightly upheld. Churches of Christ have historically advocated and defended the essentiality of water baptism (immersion) throughout our history in preaching, teaching, writing, and debating. However, we have failed to see the nature of Holy Spirit baptism and the full meaning of the one birth of water and Spirit. It has taken us a while to see the conceptual connection between the various aspects of Holy Spirit doctrine. But from the study in which we have been for a long time engaged on the Holy Spirit, we see now more clearly than ever how passages on the Holy Spirit fit together so harmoniously. And we see the connection between the various cases of “conversion” that we read about in the book of Acts. We have in the past had to unintentionally “torture” certain texts to make them teach what they never said. We did not do this on purpose nor with malice. But because we had the wrong idea as to the nature and purpose of Holy Spirit baptism, we wound up “rewriting” Scripture. When we get the doctrine of Holy Spirit baptism correct, we can then see clearly (1) the fact of the personal indwelling, (2) the fact of internal Spirit help, and (3) the complete rather than partial nature of the new birth, and even (4) a connection between the nature of the Christian and his prospects in the coming resurrection! So many wondrous truths come together when we reinvestigate the meaning of the Lord’s precious words to Nicodemus: “…Except one be born from above, he cannot see the kingdom of God…Except one be born of water and Spirit, he cannot enter into the kingdom of God” (John 3:3, 5). If the reader can make a valiant effort to put aside preconceived notions and personal prejudices that may have been entrenched in his heart for years and years regarding the topic of Holy Spirit baptism, and if he will demand of me that the conclusions I present are supported by conclusive proof, he has my sincere appreciation. It took a while for others to get me to revisit the topic. I did not want to have to give serious attention to a topic that I was convinced had been long ago understood by most of our brethren. But I was so wrong in thinking that most of us had understood it and that I, therefore, did not need to give more attention to it. I can appreciate the reluctance that some now have in not giving the topic the attention that I am convinced that it certainly deserves. We will never see the coherence between all the passages on the Holy Spirit that discuss his relationship to Christians unless and until we get our minds correctly settled on the topic of Holy Spirit baptism. It is that fundamental and crucial. Once we understand what Jesus really said in John 3 to Nicodemus, we can then understand the progression of the history in Acts and finally see how all of the cases of kingdom entry as recorded by Luke fit together without a single exception. There are no cases of exception to the requirements of kingdom entry in the book of Acts!